The only book this year that provides every recipe and idea that you will need to plan and enjoy the months ahead of Christmas to New Year's Eve. Sarah Raven, author of 2007's stunning Garden Cookbook (voted cookbook of the year by the Guild of Food Writers' and the Independent), presents the last word on food, flowers and decorations for the Christmas season. First, Sarah guides us through the Christmas build-up, suggesting puddings, sauces and edible presents to prepare before everything becomes too hectic. She then offers maximum-impact, minimum-fuss flowers and decorations, stylish party nibbles and a host of Yuletide meals for every palate, including a last-minute recipe for the all-important Christmas pudding. Finally, she sees us safely through Christmas Day, Boxing Day and beyond, with fantastic ideas for the inevitable mountain of leftovers. Sarah Raven is the perfect companion for Christmas, with her unrivalled expertise both indoors and in the garden and her emphasis on traditional methods with a fresh, modern aesthetic. 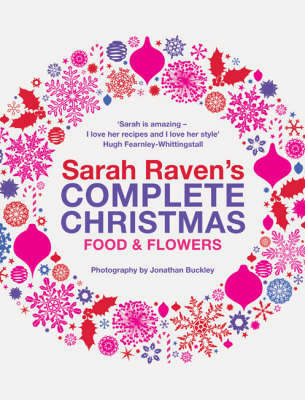 With 175 food recipes and 40 recipes for flowers, and complemented as always by Jonathan Buckley's sumptuous photographs, Sarah Raven's Christmas Book will be a must-have manual for every home next Christmas and for many years to come.